Use Oracle Fusion Project Foundation and other Project Financial Management applications to centrally perform project costing, billing, accounting, and executive reporting. Export projects to Oracle Fusion Project Management to plan, progress, and execute projects. The following is a brief overview of how the applications work together. Specify the integration name and project unit. Select an integration planning resource breakdown structure. Define how rates are derived when exporting resources. Specify how data is processed during import and export. Export labor resources and financial resources from the integration planning resource breakdown structure to create project enterprise resources. Activate the integration and export your project and tasks to perform detailed resource planning, scheduling, and progress collection. Projects you previously exported to Primavera P6 Enterprise Project Portfolio Management, cannot be exported to Oracle Fusion Project Management. The initial export links project and task information in the two applications, and enables you to incrementally export project and task data to Oracle Fusion Project Management. In Oracle Fusion Project Management, you can add subtasks under the exported tasks. You can also assign resources to the subtasks to complete detailed planning. After you export a project, you cannot delete the exported tasks, increase or decrease indent, or move the exported tasks within the project plan in either application. After you export a project to Oracle Fusion Project Management, build out the project plan, add subtasks under integrated tasks, assign resources, and complete planning to the desired detail. When you are ready, import the updated project plan and progress information. When you import a project, the application summarizes planning and progress information for each resource across all subtasks within the hierarchy of each integrated task. Summarized amounts are imported into a single task assignment created for each resource on the integrated task. A baseline project plan is automatically created in Oracle Fusion Project Foundation and progress is captured and published. Based on project plan planning options, a baseline budget version can be generated using baseline project plan values and a forecast version generated based on published progress. The current date is always used as the progress as-of date for published progress. Use prevalidation messages to identify errors that prevent export of your project plan from Microsoft Project to Oracle Fusion Project Management. You must fix all errors before exporting a project. Identify tasks with prevalidation errors using the indicators in the Exception column in the Gantt Chart view of Microsoft Project. Following is a brief description of the prevalidation checks. After export, review the transfer report to determine if errors or warnings occurred for checks other than those performed during prevalidation. The following table describes prevalidation rules for tasks and resource assignments. One labor and multiple expense resources are allowed for a lowest-level task. Remove other resources. Only one labor resource with zero allocation is allowed for a summary task. Remove all other resources. No subtasks are allowed under milestone tasks. Milestones must be lowest-level tasks. Milestone tasks must have zero duration. Only one labor resource, with zero effort, is allowed for a milestone task. Remove all other resources. Use Oracle Fusion Project Integration Gateway to integrate Oracle Fusion Project Portfolio Management with Primavera P6 Enterprise Project Portfolio Management. The integration enables project accountants, project billing specialists, and executives to centrally perform project costing, billing, accounting, and executive reporting tasks in Oracle Fusion Project Portfolio Management while enabling each project manager to perform detailed project planning and scheduling in Primavera P6 Enterprise Project Portfolio Management. Oracle Fusion Project Integration Gateway is currently not available in Oracle Cloud implementations. Oracle Fusion Project Integration Gateway ensures data security, integrity, and efficiency by defining a set framework in which data is exported from and imported into Oracle Fusion Project Portfolio Management. The following table and diagram provide an overview of the flow of information. Export resources from the integration planning resource breakdown structure and associated rates to the global dictionary for resource and roles in Primavera P6 Enterprise Project Portfolio Management. Before export, raw or burdened cost rates are derived using logic for actual cost rates, increasing the accuracy of planned costs calculated for planned units. Export either accounting or project accounting periods to use in Primavera P6 Enterprise Project Portfolio Management and to enable import of periodic project plans into Oracle Fusion Project Portfolio Management. Create projects and the task structure required for financial management and reporting in Oracle Fusion Project Portfolio Management. You can then activate project integration and export project and tasks. Define a template called Oracle Fusion Applications Integrated Project Template in Primavera P6 Enterprise Project Portfolio Management to create projects based on your preferences. Export processing creates links between the project and tasks in Oracle Fusion Project Portfolio Management and the project and WBS created in Primavera P6 Enterprise Project Portfolio Management. All export and import processing is dependent on these links. Export summarized actual amounts, as required, for comparing with planned amounts. For each integrated WBS that is linked to a lowest-level task, a summary activity is created to store actual quantity and costs in Primavera P6 Enterprise Project Portfolio Management. After exporting a project and its tasks to Primavera P6 Enterprise Project Portfolio Management, you can build out the project structure, add WBS nodes and activities, assign resources, and complete planning to the desired detail. Use resources, roles, and expense categories created in the global dictionary based on the integration planning resource breakdown structure. Integration supports manual creation of resources or planning for labor or nonlabor amounts directly against activities in Primavera P6 Enterprise Project Portfolio Management. Import project plan information into Oracle Fusion Project Portfolio Management as required. Before import, planned amounts for each resource are totaled across all activities and child WBSs within the hierarchy of an integrated WBS. The summarized planning amounts are imported into a single task assignment that Oracle Fusion Project Portfolio Management creates for the resource against the lowest-level task associated with the integrated WBS. After import, a baseline project plan is automatically created in Oracle Fusion Project Portfolio Management and progress is captured and published. A baseline budget version can be created simultaneously based on project plan planning options. For contract-based projects, you can export billing events that are assigned to milestone tasks to create finish milestone activities under the integrated WBS in Primavera P6 Enterprise Project Portfolio Management. Import event completion information into Oracle Fusion Project Portfolio Management, as required, so that you can initiate contract billing activities. You export projects to Primavera P6 Enterprise Project Portfolio Management after you have completed high-level planning (created tasks up to the desired financial planning and reporting level) in Oracle Fusion Project Portfolio Management. You must activate integration for a project before exporting it. For subsequent exports, you can export all information for the selected linked projects or only incremental changes since the previous export. Use the full export option to recreate an integrated WBS that was inadvertently deleted in Primavera P6 Enterprise Project Portfolio Management or to restore the WBS hierarchy to match the task structure in Oracle Fusion Project Portfolio Management. In Primavera P6 Enterprise Project Portfolio Management, exported projects are added to an enterprise project structure (EPS) node called Imported Projects. Move the exported projects to a different EPS node as required. 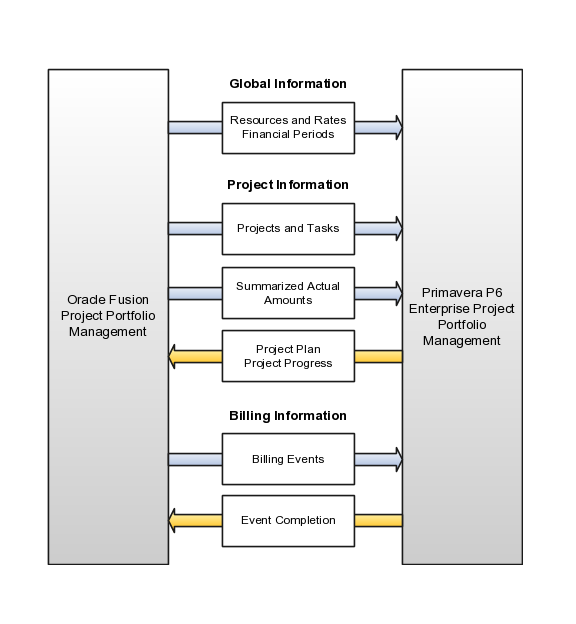 As illustrated in the following diagram, during initial export, project information from Oracle Fusion Project Portfolio Management is used to create a new project in Primavera P6 Enterprise Project Portfolio Management. Alternatively, if the project number of a project matches the project ID of an existing project in Primavera P6 Enterprise Project Portfolio Management, then the two projects are linked. Similarly, WBSs are created for each task in the hierarchy, up to the lowest-level task. The tasks and WBS are linked. If you build out your WBS in Primavera P6 Enterprise Project Management by adding further WBS and activities, all information is summarized up to the integrated WBS before project plan information is imported into Oracle Fusion Project Portfolio Management. The following table describes how changes in the task structure in Oracle Fusion Project Portfolio Management affect the WBS of a linked project during a subsequent export. New WBS created and integrated with task. If the task number of the new task matches the WBS ID of an existing WBS, then it is linked to the new task. Integrated WBS is not deleted. You must manually delete the WBS and revise planning, if required. Indent for integrated WBS is increased or decreased accordingly. Modified task attributes, including name, description, and task manager, are used to update WBS information. New WBS created for subtask. You must move planning information from the parent WBS to the new WBS to continue importing it into Oracle Fusion Project Portfolio Management. When you export projects, project and task attribute values are used to update project and WBS information in Primavera P6 Enterprise Project Portfolio Management. Following is a description of the project and task attributes exported from Oracle Fusion Projects. The following table describes some of the important project attributes exported from Oracle Fusion Projects. Primavera P6 Enterprise Project Portfolio Management restricts the length of project names and project IDs to100 and 20 characters respectively. Therefore, project names and numbers from Oracle Fusion Projects are truncated if their length is over the limit. When a WBS is created based on a task exported from Oracle Fusion Projects, the attribute Integrated Type is used to indicate that the WBS is integrated. Other WBS attributes updated using information exported from Oracle Fusion Projects are described below. WBS code is set to the task number or the last segment of the outline number depending on the value of the WBS Code Source integration option. Integration processing transforms the outline number into a sequence number based on the position of a task in comparison to peer tasks. For example, the sequence number of task 1.0 is 10, task 2.0 is 20, and task 3.0 is 30. Similarly, the sequence number of task 1.1 is 10, task 1.2 is 20, and task 2.1 is 10. The Chargeable option only impacts WBS that are mapped to lowest-level tasks. If the corresponding task is not chargeable, then the integrated WBS is marked as inactive and is not visible on the timesheet. Primavera P6 Enterprise Project Portfolio Management restricts the length of WBS names and WBS IDs to 100 and 20 characters respectively. Therefore, task names and numbers from Oracle Fusion Projects are truncated if their length is over the limit. Perform detailed project planning and resource assignments in Oracle Fusion Project Management before importing the project plan. You must designate the project as a planning project to import project plan information. The following table describes other project options that affect how project plan information is imported, and are therefore set to an appropriate value automatically. Set to the integration planning resource breakdown structure. Option is deselected because imported task assignment dates may be different from task dates. Option is selected so that import processing can calculate costs based on imported effort. Importing project plan information overrides all planning information already in Oracle Fusion Project Foundation. For example, any task assignments you create directly in Oracle Fusion Project Foundation are updated if corresponding resource assignments exist in Oracle Fusion Project Management or are deleted if no corresponding resource assignment exists. 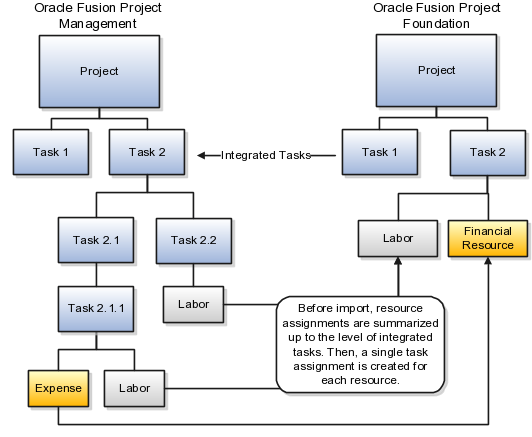 As illustrated in the following diagram, before import, assignment information is summarized up to the level of the integrated task. Then, for each integrated task, import processing creates a single task assignment in Oracle Fusion Project Foundation for every resource assigned within the hierarchy of the integrated task, irrespective of the number of assignments. If a resource is assigned to multiple subtasks within an integrated task in Oracle Fusion Project Management and assignment dates do not overlap, then separate task assignments are imported. Import processing creates the separate task assignments based on financial periods in Oracle Fusion Project Foundation. The following information is imported and assigned to task assignments. Earliest start date and latest finish date of all occurrences of the resource within the hierarchy of the integrated task. If actual dates are unavailable in Oracle Fusion Project Management, task assignment dates are set to the imported planned dates. Costs are calculated based on the project plan planning options. If actual dates are unavailable in Oracle Fusion Project Management, they are left blank on the task assignment. If the project currency and project ledger currency are different in Oracle Fusion Project Foundation, then the raw and burdened costs in project currency are calculated based on settings in the project planning options. Resources that do not exist in the integrated planning resource breakdown structure or are not yet exported. Task assignment is created using a resource class level resource. Resource assignments without start or finish dates are not included in the import. If planning in Oracle Fusion Project Foundation is by period, then import processing allocates summarized amounts to periods based on the spread curve for the planning resource. If you delete a resource assignment in Oracle Fusion Project Management, then integration processing checks if the task assignment can be deleted in Oracle Fusion Project Foundation as well. If it cannot, then planned quantity is set to zero. Apart from imported data, the following logic is used to provide information for task assignment-related attributes. Set to default value specified for the planning resource in the planning resource breakdown structure. Set to Remaining Plan. If you change this value, it reverts to Remaining Plan during the next import. Value not set automatically. If you enter an override, then this information persists after subsequent import. Set to the project ledger currency. Option deselected. All task assignments coming from Oracle Fusion Project Management are considered planned. Project planning and resource assignment are performed in Primavera P6 Enterprise Project Portfolio Management before being imported into Oracle Fusion Project Portfolio Management. To import project plan information into Oracle Fusion Project Portfolio Management, the project must be designated as a planning project. Other project options that affect how project plan information is imported, and are therefore set to an appropriate value automatically, are described in the following table. Set to the planning resource breakdown structure selected on the Manage Integration Options page. Period profile: If the calendar type changes during import, then set to the default period profile selected in the integration options. Current planning period: Set to the period of the project start date. Option deselected because task assignment dates imported from Primavera P6 Enterprise Project Portfolio Management may be different from task dates. Option selected so that Oracle Fusion Project Portfolio Management can calculate costs based on quantities sent from Primavera P6 Enterprise Project Portfolio Management. Importing project plan information from Primavera P6 Enterprise Project Portfolio Management overrides all planning information already in Oracle Fusion Projects. For example, any task assignments you create directly in Oracle Fusion Project Portfolio Management are updated if a corresponding resource assignment exists in Primavera P6 Enterprise Project Portfolio Management or are deleted if it does not. As illustrated in the following figure, before import, assignment information is summarized up to the level of the integrated WBS that is linked to a lowest-level task. Then, for each integrated lowest-level task, a single task assignment is created in Oracle Fusion Project Portfolio Management for every resource assigned within the hierarchy of the integrated WBS, irrespective of the number of assignments. Task assignment information is populated using data imported from Primavera P6 Enterprise Project Portfolio Management based on the resource type, as described in the table below. At completion units summarized and imported by financial period. Costs calculated based on planning options in Oracle Fusion Project Portfolio Management. At completion cost summarized and imported as planned quantity (where UOM is Currency). In case the project currency and project ledger currency are different in Oracle Fusion Project Portfolio Management, then the raw and burdened costs in project currency are calculated based on settings in the project planning options. At completion units summarized and imported by financial period. Costs are calculated based on planning options in Oracle Fusion Project Portfolio Management. Costs or units imported based on resource type. Material resources and expense categories: At completion cost summarized and imported as planned quantity (where UOM is Currency). Labor and nonlabor resources, roles: At completion units summarized and imported by financial period. Costs calculated based on planning options in Oracle Fusion Project Portfolio Management. If you delete a resource assignment in Primavera P6 Enterprise Project Portfolio Management, then Oracle Fusion Project Portfolio Management checks if the task assignment can be deleted as well. If it cannot, then planned quantity is set to zero. Apart from imported data, Oracle Fusion Project Portfolio Management uses the following logic to provide information for other assignment-related attributes. Set to Remaining Plan. If you change this value, it is reset during the next import. Value not set automatically. If you enter an override, then this information is not changed during subsequent import. What happens if I plan for labor and nonlabor directly against an activity in Primavera P6 Enterprise Project Portfolio Management? When you import project plans, task and task assignment values are updated based on integrated WBS information in Primavera P6 Enterprise Project Portfolio Management. The following table describes the assignment amount and period-related attributes imported into Oracle Fusion Projects. When you import information for nonintegrated resources or for direct planning against activities, the resource type determines the resource class-level resource used for the corresponding task assignment in Oracle Fusion Projects. For nonintegrated expense categories or roles, Oracle Fusion Projects always uses the resource class-level resources Financial Resources and Labor respectively. The following table describes how date-related information is imported from Primavera P6 Enterprise Project Portfolio Management. Actual start and finish dates for the WBS are imported when available. Else, start and finish dates are imported. These dates are imported because task planned dates do not roll up from assignment dates for integrated projects in Oracle Fusion Projects. 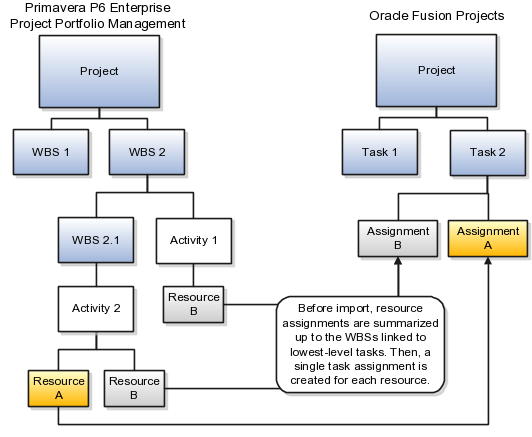 WBS dates are imported when creating task assignments in Oracle Fusion Projects using resource class level resources. For example, if expense categories or nonintegrated resources are assigned or you plan for labor or nonlabor directly against an activity in Primavera P6 Enterprise Project Portfolio Management. Actual start date for the assignment is imported from Primavera P6 Enterprise Project Portfolio Management when work is in progress or completed. Start date is imported when work has not started. Actual finish date for the assignment is imported from Primavera P6 Enterprise Project Portfolio Management when work is completed. Finish date is imported when work has not started or is in progress. Task assignment dates are based on the start and finish dates of the WBS. Following are details related to using the Financial Resources and Material Items resource class resources when using nonintegrated resources and the calculation of progress information. When using the Material Items resource class resource to import information for nonintegrated resources, Oracle Fusion Projects uses the at-completion cost from Primavera P6 Enterprise Project Portfolio Management as the planned quantity. Importing planning quantity is not meaningful because each material resource can have a different UOM. In addition, the resource class Material Items in Oracle Fusion Projects uses a UOM of currency. Similarly, when creating task assignments using the Financial Resources resource class resource, the at-completion cost specified in Primavera P6 Enterprise Project Portfolio Management is used as the planned quantity in Oracle Fusion Projects. As with material items, the UOM for the financial resources in Oracle Fusion Projects is Currency. Estimate-to-complete values are calculated for nonintegrated resources using the imported planned amounts, as they are for other resources. However, actual dates are not imported. Derivation of actual dates takes place in Oracle Fusion Projects. For example, if the task assignment in Oracle Fusion Projects has actual amounts, then the actual start date is set to the start date of the period with the actual amounts. Actual date information is not imported because the generic resource class task assignment in Oracle Fusion Projects can incorporate planning from a variety of different resources from multiple activities and child WBSs in Primavera P6 Enterprise Project Portfolio Management. Importing planned amounts for a task assignment from Primavera P6 Enterprise Project Portfolio Management and the actual amounts for the unplanned task assignment in Oracle Fusion Project Portfolio Management fall within the imported planned dates. Scenario 1 is represented by Resource A. Importing planned amounts for a task assignment from Primavera P6 Enterprise Project Portfolio Management and the actual amounts for the unplanned task assignment in Oracle Fusion Project Portfolio Management fall outside of the imported planned dates. Scenario 2 is represented by Resource B. Importing a task assignment from Primavera P6 Enterprise Project Portfolio Management that has 0 planned amounts for a resource with an unplanned task assignment in Oracle Fusion Project Portfolio Management. Scenario 3 is represented by Resource C.
Importing a project plan from Primavera P6 Enterprise Project Portfolio Management that doesn't contain any planning for a resource with an unplanned task assignment in Oracle Fusion Project Portfolio Management. Scenario 4 is represented by Resource D.
Actual amounts were captured, processed, and summarized in Oracle Fusion Project Portfolio Management before the project plan containing planning for the resource was imported from Primavera P6 Enterprise Project Portfolio Management. As a result, unplanned task assignments exist in Oracle Fusion Project Portfolio Management for a task. The project and task were previously exported to Primavera P6 Enterprise Project Portfolio Management. Now the project manager plans for resources for the WBS that is integrated with the task that has the unplanned task assignments. The project plan is imported into Oracle Fusion Project Portfolio Management and the existing unplanned task assignments are impacted as follows. Unplanned task assignment set to planned and planned hours and dates are set to match the imported hours and dates. Task assignment remains unplanned in Oracle Fusion Project Portfolio Management with no change to planned dates. The resource isn't planned in Primavera P6 Enterprise Project Portfolio Management, but the unplanned task assignment must remain in Oracle Fusion Project Portfolio Management to hold the actual amounts. What happens if a resource is assigned to multiple activities on an integrated WBS in Primavera P6 Enterprise Project Portfolio Management? Planning for all activities roll up to WBSs. Totals for each resource are then imported into Oracle Fusion Project Portfolio Management for each lowest-level task that maps to an integrated WBS. A single task assignment is created or updated in Oracle Fusion Project Portfolio Management for each resource with rolled up planned amounts for the integrated WBS.